The anniversary parade in Moscow on May 9 will be one of the most massive events in the history of celebrations. TOMSK, May 9. /TASS/. 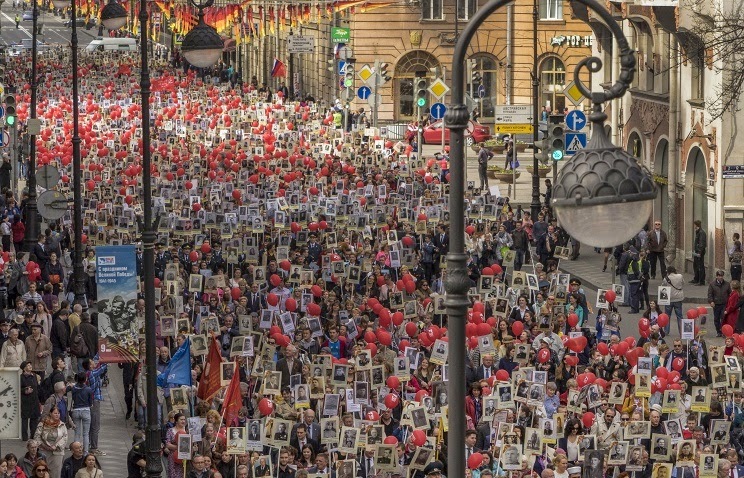 Up to one million people worldwide will take part in the so-called "Immortal Regiment’ marches, during which ordinary people carry photographs of their relatives who took part in the Great Patriotic War (a term used in Russia and other former Soviet republics to describe hostilities on the eastern fronts of World War II in 1941-1945). The Immortal Regiment action was first held in the Siberian city of Tomsk in 2012. In 2013, it was already held in 120 cities with Kazakhstan and Ukrainian joining the event, which gathered a total of about 200,000 people. Last year the Immortal Regiment was joined by Israel, Kyrgyzstan and Belarus. This year the event already took place in the United States and is expected to be held several cities of Norway, the German capital of Berlin, Dublin, Beirut, Vienna and other cities. 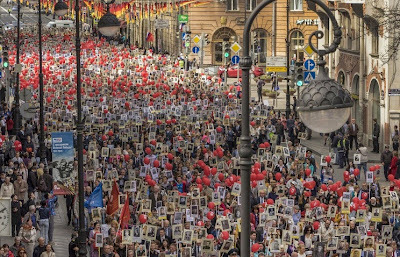 At least 150,000 people are expected to take part in the march of the Immortal Regiment in the Russian capital of Moscow after President Vladimir Putin permitted them to march down the central Tverskaya Street and Red Square after the annual Victory Day Parade. The parade will showcase 16,000 military servicemen marching, 194 units of military hardware and 143 combat aircraft. A historic reconstruction is also planned for the parade. Some people will be dressed in uniforms of the times of the Great Patriotic War - infantrymen, sailors, pilots, sappers, cavalrymen and Cossacks. Military units from Azerbaijan, Armenia, Belarus, Kazakhstan, Kyrgyzstan, Tajikistan, India, Mongolia, Serbia, China will participate in the parade. Around 2,300 people have been invited to the Red Square for celebrations, including veterans from Russia and abroad. According to official data, about 27 million Soviet citizens, including both civilians and servicemen, died in the Great Patriotic War against Nazi Germany in 1941-1945. Documentary film: "Crimea way back home"